Body Dysmorphic Disorder, more specifically its subcategory; Muscle Dysmorphia aka "Bigorexia" involves symptoms that affects men through feelings of shame as it grows within the secrecy of an overly masculinized culture. Symptoms include anabolic steroid use and engaging in mechanical routines that both affect quality of life in a destructive way. The consistent need to have more lean muscle mass and less body fat and the inadequacies experienced can ultimately result in a life not worth living. Castle - Broken explains how young men can suffer from inadequacy and destructive solutions centered on their perceived body image, along with what research says to support effective methods of treatment. Research however, is limited and relatively new and faces irrelevancy in a time where social media changes society in quick, intense waves. This body image disorder tells the world everything is under control when on the inside you are broken. Those who suffer from Muscle Dysmorphia never see themselves as adequate as they never truly see themselves which causes chronic, intense mixed social feelings. "Written for the lives of others"
L.A. Meier outlines a personal account of the male pursuit of physical perfection, from high school peer-pressure and into his adult life. 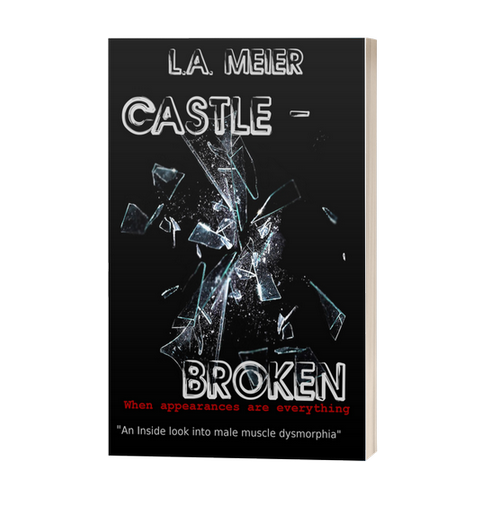 Castle - Broken explains the meticulous diet regime of body builders, the experimentation with anabolic steroids and the acknowledgement and treatment of Muscle Dysmorphia.